STUFF that you can use. 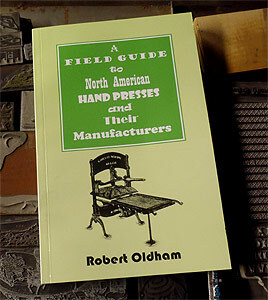 Robert Oldham's Field Guide to North American Hand Presses is a very complete and fascinating retrospective look at the standard Iron and Wood Hand Presses used by American Printers from 1800-1900. 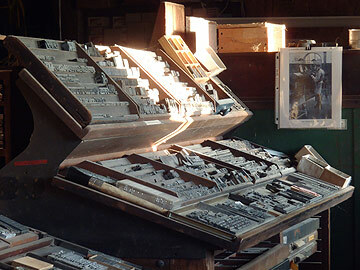 - includes photos of dozens of presses with information about their makers and where they are now. If you have any interest in these neat old platen presses - the precursors to the Gordons, Goldings and Kelseys we use today, this is a must-have desk reference which will give you greater insight into those old hand presses that changed American History. So, Yes, this is our own unabashedly commercial "shameless commerce" part of the website. WE HAVE FINALLY REALIZED that developing and maintainining a collection of old printing presses - and paying the rent month after month for the past 25 years (so far) takes both a lot of time and a fair amount of money. And, since we've got more stuff than we really need, and since the simple fact that you are here viewing this page suggests that you might want or need some of these treasures we've collected over the past 45 years or so, we have some really neat stuff (and maybe some junk) for sale. We hate to part with any of it, actually, but really, how many midget-sized Hamilton Furniture Racks does one print shop need? We've got some spares. And we need to pay the rent. They're for sale. And, we've got furniture - loads of it. "A lifetime supply", is how I describe it. But how many chases do I want to lock up at one time? And how often will I leave furniture in galley forms? A few fonts of furniture is all that we need. So we can sell some to you. As much as you need. We've got type. We love type. We can't walk past a font of type without yearning to add it to our composing room. And surfing eBay drives us crazy! Plus people keep bringing us more stuff for the museum, so we're always adding more fonts to our collection. Often we get duplicates - or even faces we just don't use in our style of work. They're for sale, too. 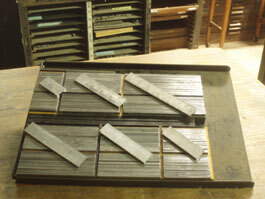 AND, now that Barry's brought down his Linotype, Interype, Ludlow & Colt, we have his spare quoins, furniture, etc. to add to the collection, and he's kindly agreed that we should sell it to cover expenses - and our newest expense is the $1200 it cost to move the line casters to The Excelsior Press. And quoins! Boy, have we got quoins! enough chatter. Here's the list: but remember - Most of this is used, and is available "Only while supplies last"
What do I need in my starter kit? The basic question whose answer will help us decide just what you need is "Do you plan to set type and print using traditional methods, or do you plan to print only from photopolymer plates - or a combination of both?" In either case, you will need ink, tympan paper and gauge pins. 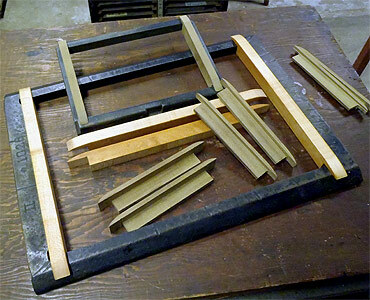 For the 5x8 or larger press, you may also find Megill Extension Feed Guides to be very helpful. If you plan to print from photopolymer plates only, an Excelsior Chase-Base or a wooden Excelsior Plate Base would be an asset. 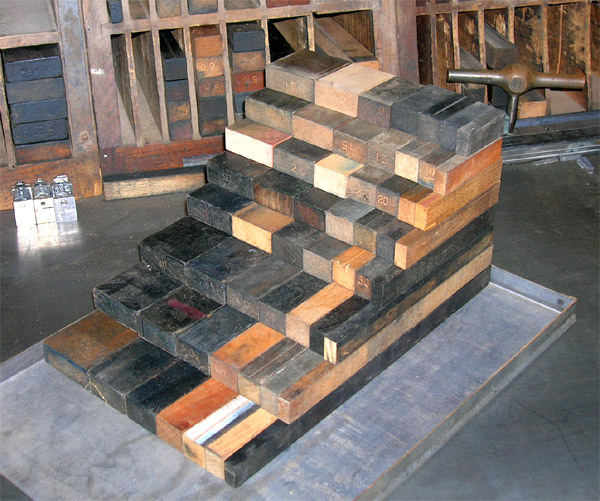 It could be used instead of the well-known "BoxCar Base" sold by Boxcar press, and offers certain advantages over it. Either base can be used with anyone's photo polymer plates. We recommend, btw - deep-etch engravings or photo-polymer plates for best results on a small platen press. Once we figure out exactly what you will need, we will put together a packing list and post it online for you to review. Once the order is approved, we will pack it up, generate an invoice which would include a PayPal "Pay Now" button, print a shipping label and get it all ready to ship to you. It may help to discuss your needs and interest directly, so please do feel free to contact us with any specific questions you may have through the contact form or by phone at 908 627-2730. And please do also send us your mailing address. We ship using the USPS Flat-Rate boxes, so the rates are pretty standard, and your package would be delivered by your local mail carrier. Please take some time to review the contents of this page and write with any questions you may have about your new press and the supplies you will need to get the most out of it. We do realize that there is a lot to consider on this page, and it can be overwhelming. We are here to help, so do not hesitate to write with any questions you may have. We will respond just as quickly as we can. 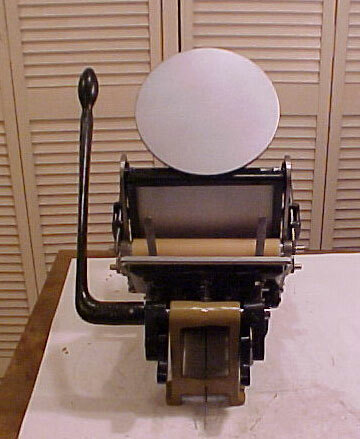 Many folks find or buy a press by itself without the "ancillary items" they will need to actually use their new press. To fill this need, we have put together a number of 'starter kits' that will give you everything you need to begin printing. But your needs may vary, so we have broken this down into some categories, with ala carte an option as well. 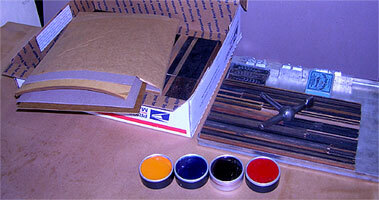 * Kits up to 5x8 ship in Medium USPS Flat-rate box for $13.50 - insured. plus custom phrases of your choice... @ $4/line. Many fonts available. listing & Font Samples to be posted soon. - use these to set all four corners at one time and save time and frustration. IRHG - INK ROLLER HEIGHT Gauge - $8 - simply a 12" piece of 18 point solid border. The *ideal* tool for checking roller height on a platen press. Update: 10/17: We have precisely weighed each tub and updated prices bases on actual weight AND Van Son's increased prices. 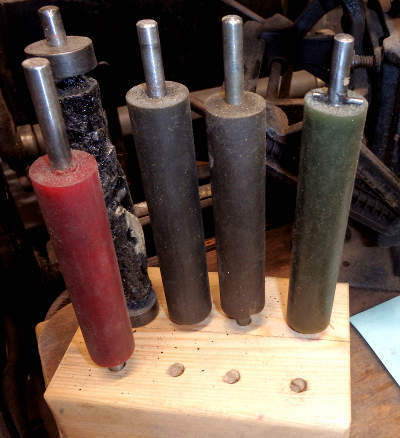 We cast our own Rubber Ink Rollers - on YOUR CORES or OUR new 3/8" or 5/16" custom-made roller shafts with locking trucks - machined here at the Excelsior Press Museum Fabrication Shop. All Excelsior-cast rollers come with a 5-year 100% satisfaction guarantee/warranty. Most Complete Roller & Truck sets are priced between $165 and $195 US. And, if you are in a rush and we are out of stock, we recommend Todd's Presstime on eBay. Our roller trucks are machined of high density Delrin and are broached to lock onto our drilled and pinned roller shafts. We are now also offering a roller height gauge and truck wrapping tape with all orders. 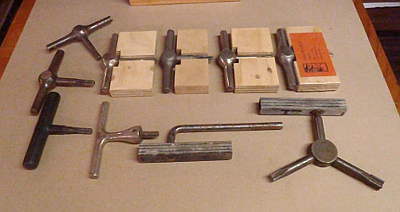 Sigwalt, Baltimore, Kelsey Junior & 3x5 Craftsmen rollers - 7/8" by length to fit press. We also make rollers for most similar-sized presses at similar prices. ALL PRESSES USE 1.25" diameter rollers! 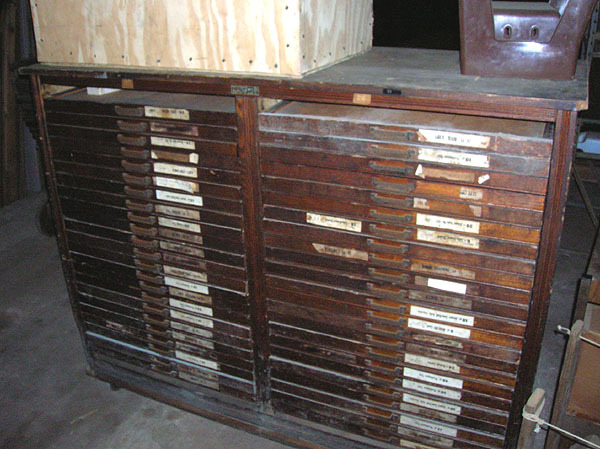 Back in 2010, the late Gene Mosher, last owner of the Kelsey Company, gave me a file box filled with notes about roller sizes for all sorts of presses - Kelseys and dozens upon dozens of other presses. Sad to say, some of the rollers I have been asked about since then did not appear among these 100-year-old collection of file cards. For those presses, I developed a procedure to measure shaft length - based upon distance between roller hooks or t-head, taking into consideration the distance between rails on the press as well as the actual form size the chase can handle. Then I measure the center line distance between the hooks or rockers that hold the rollers in place. In the case of the three most common Kelsey presses - the 1928 designed 3x5, 5x8 & 6x10, all rollers are mounted 22/16" apart. That allows for 1.25-21/16=1.3125 diameter rollers. A 1.25" diameter roller will cover almost 4" - (actually 3.93") of ink disk and/or form before "ghosting" - far more than is needed for a 3x5 press, and plenty for a 5x8. On the 6x10... ghosting is possible, depending upon the form being printed. While this conjecture was just that - conjecture on my part, I was rewarded not only to discover that my calculated roller dimensions nearly always matched the "official" roller dimensions of these presses when they were discovered from other sources. Moreover, according to Elizabeth Harris' book on small presses, Kelsey standardized on 1 1/4" (1.25") as the diameter of all three of their smaller presses in 1894. 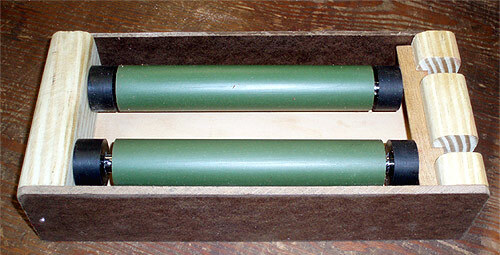 Ink Roller Bearers aka Roller Tracks -NEW! - Our roller bearers are made here in the shop from new hardwoods or recycled wood furniture pieces cut to fit precisely - type high - .918" - on our 1.0-point precision Hammond Glider Trim Saw. Bearers are then finished - for protection from ink stain and solvents - with the same Paraffin Oil used by The Thompson Cabinet Company when they made the furniture they sold to the Kelsey Company and to print shops throughout the country for many years. Note: Be VERY CAREFUL when using roller bearers. Remember, they are type high. Be sure to check for clearance with your grippers and your gauge pins or they could be crushed! Excelsior "Chase Base" ®- "replace your chase" with a hardwood blocked Cherry, machined Richlite® or 9-ply Baltic Birch Excelsior Chase-Base. 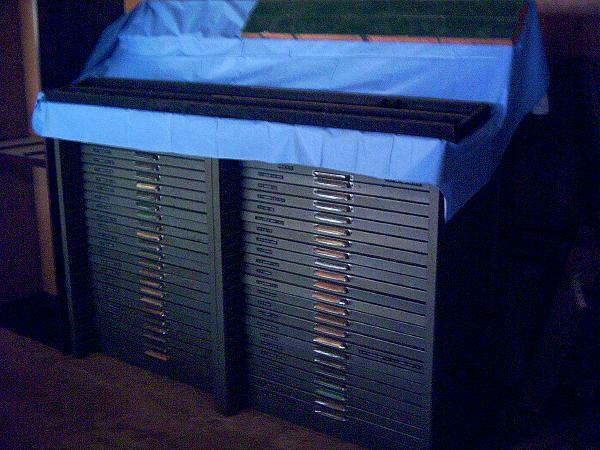 Used for printing from deep-etch (K-series) photo-polymer plates. 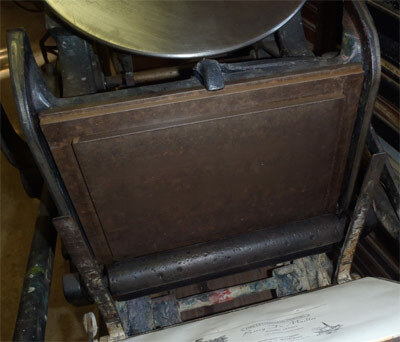 Mounts in your press just like a chase - but does not require that you have a chase, furniture, quoins or a quoin key - AND it gives you the largest image size possible for your small press. Note: 10/20/2011 We are beginning R&D making Chase-Bases of a more stable material - Richlite - an eco-friendly material used in aircraft as well as counter tops. Richlite is a very hard, durable, yet machinable phenolic resin and wood fibre laminate. This product is stable, abrasion resistant, moisture and chemical resistant. It should make a superior Chase-Base. We will post results of our tests online once they are completed. 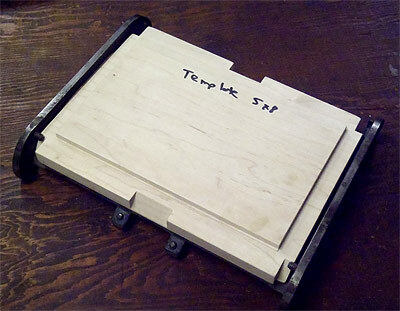 Please check with us regarding current inventory of the Blocked Cherry Wood, 9-ply Baltic Birch Engraver's Mounting Base or Milled and Machined Richlite base you require. It will likely take a while to catch up with delayed orders, so please bear with us and be patient as we manufacture the best Chase-Base that we can. Style B is now made using a Phenolic Resin Laminate which utilizes recycled paper for body. Milled to fit the bed just like the Kelsey Chase. all presses listed to the left. note: although these are an inexpensive alternative a well-known & popular photopolymer base, these are *not* machined metal, nor do they include the alignment grid. But plates mount easily and are easily aligned - AND users report excellent results when using our special flexible gauge pins. ** Old vs New Style Kelsey Excelsior 5x8 Chase Bed Comparison. Note the old style bed in the background. It uses iron wedges - cast into the bed - to hold the chase in place. It is 1/8" tighter than the new style shown in the foreground. The New Style Chase Bed uses pins or set screws to hold the chase at the bottom. It is 1/8" wider than the old style. 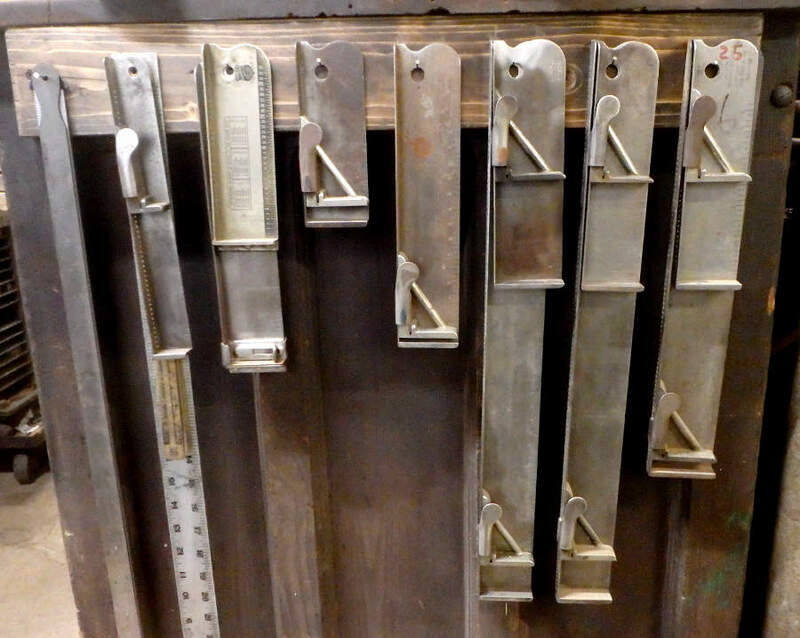 Be sure to tell us which one you have so that the base we send you fits your press perfectly. The bed of the Kelsey Excelsior 6x10 Model X is 6-12 points wider and 12 points taller than the bed of the Model Q. Even if you do use photo polymer plates or photo-engravings now and again, nothing beats the satisfaction - and convenience - of setting your own hand type, adding a flourish or ornament or nice piece of rule here and there, adjusting the spacing with a 2pt lead here and there - and then printing as we did in the good old days of "hot metal". (Which, of course we still do daily at the Excelsior Press) Besides, when you set your own type, and make up your own forms, you not only carry on the old letterpress tradition - established by Gutenberg when he began casting moveable type around 1450, but you also have the option of getting an idea and putting it to paper within an hour or less in many cases. There's nothing more convenient than setting hand type for short text works. Setting hand type is not as hard as it may seem. We typically teach folks the basics of typesetting and lockup in an hour or so. You can learn in class, or learn from a book, either way works. For over 100 years, the Kelsey Company taught folks around the world - in quite literally, every far-flung corner of the world - monks on mountain tops, missionaries in the jungle, boys and girls across the USA - to set type with the handy (and still available) little Kelsey Printer's Guide. 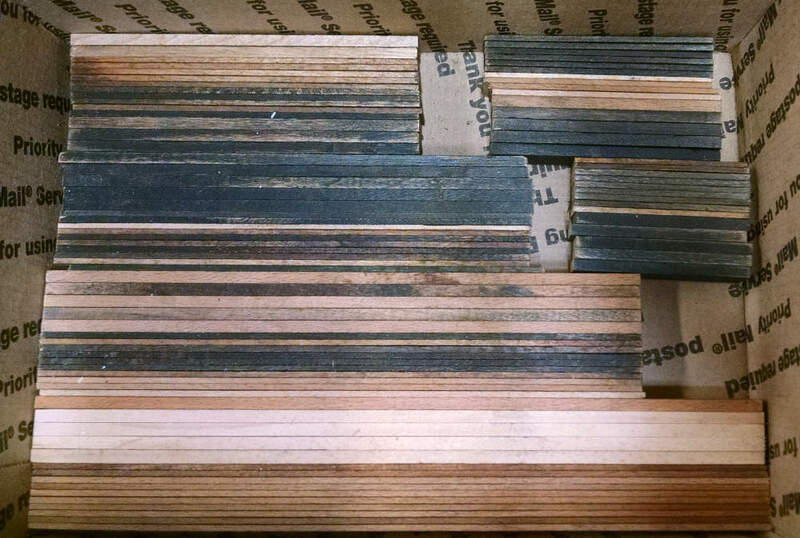 And, we have recently come upon an until quite recently unopened crate of brand new composing sticks - made in Germany about 50 years ago, but left in a crate that had not been opened in anyone's recent memory... 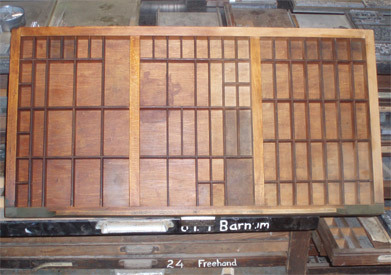 These are economy sticks - not as spiffy as the most popular of all - the Rouse Composing Stick, but they sell for quite a bit less than the Rouse stick and will serve any typesetter quite well. We use them in our shop and find them to be perfectly adequate - sturdy and accurate and easy to use. 1) Type cases - one for each font. 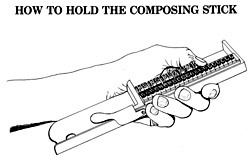 3) A composing stick holder - keeps it at an angle so nothing falls out of an unjustified line. 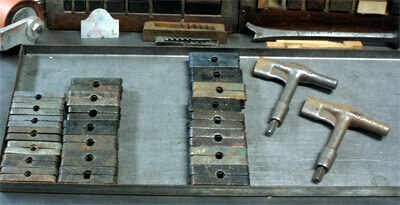 5) Galley Trays - to hold type, leads, slugs, furniture, "live forms" recently, or about to be printed. 6) Rules & borders - to enhance your designs. These come as piece borders (type), lead rule & border or brass rule. 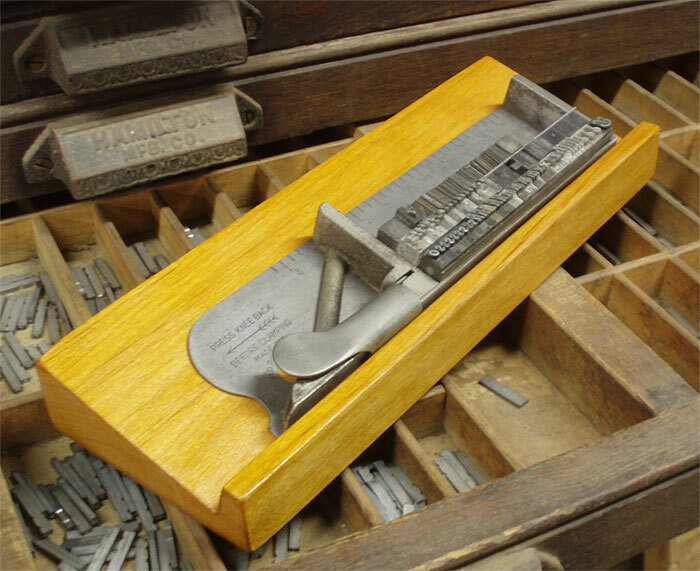 Of course, you will want some type cases to hold the type, but even if you use a few ice-cube trays to begin with, you can get started doing your own typesetting easily and at relatively little expense. 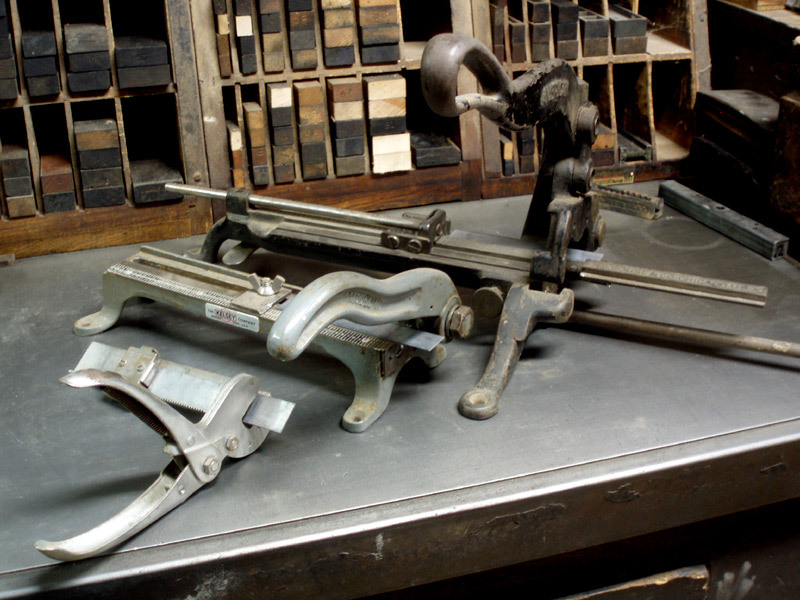 Now if you want to get a bit fancy, we also make a reproduction of ATF's old composing stick holder. Typesetting - hand composition, form makeup, and more. 2) a one-quart can of odorless mineral spirits for general cleanup - rollers, type, etc. 6) a tool for adjusting the paper gripper arms - a flat-tipped screw driver or an allen key, depending upon the gripper screws on your press. 7) an Exacto knife or some razor blades for general cutting while doing press make-ready. 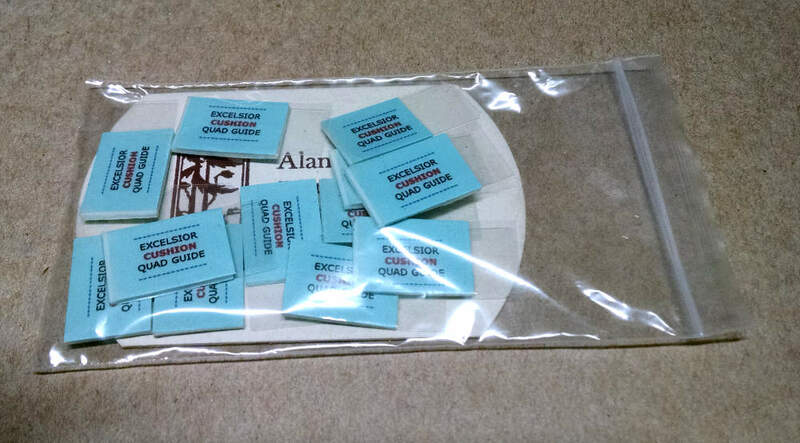 The Small Press Scoring Kit will let you score cards for easy folding. It consists of two pieces of .918" steel scoring rule; one piece cut to fit your chase horizontally, a second that will fit vertically. It also includes 3 strips of "Channel Creasing Matrix" of each length which will serve for 6 jobs. You can also use multiple staggered layers masking tape to create channels manually. I'm working on some illustrations and instructions on how to use this on the small press and will make sure to have that ready by the time you get your kit if you think it's something that you will put to good use. Please note: - Much of our furniture is freshly & precisely cut from longer lengths of good used (aka recycled) wood furniture made by Hamilton, Thompson and other industrial manufacturers of the past. Some is new, never used. Custom Lengths over 60 picas quoted by request. RCL - Custom Lengths over 60 picas quoted by request. 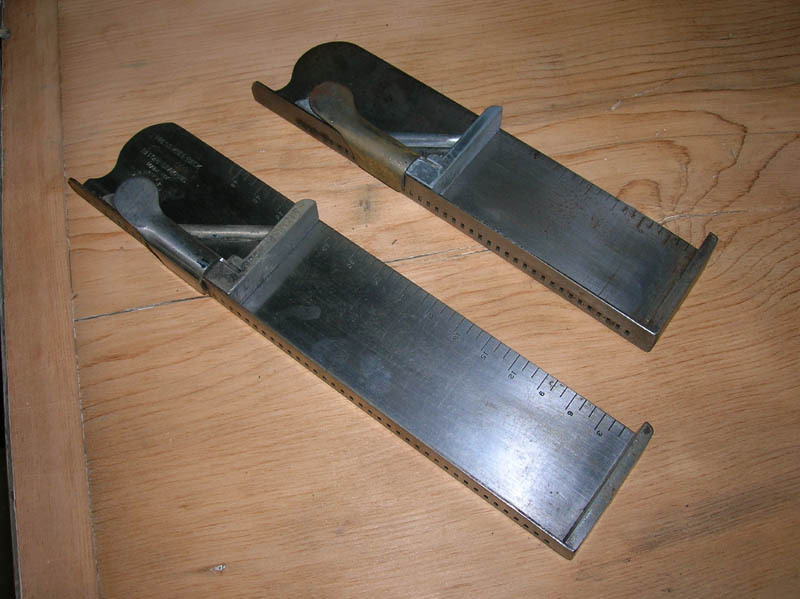 Challenge-Hempel (two-piece) wedge quoins (set of two pieces) - 10 oz. 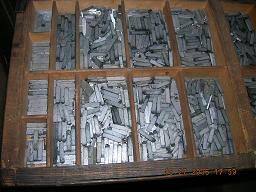 Note: Smaller presses - like Kelsey Excelsior models - with drilled chases - do not need quoins. If your press is drilled for set screws, we recommend using the screws wth our new solid steel chase bars to lock up your forms. USPS Flat Rate box - up to 70# of cut leads and slugs mailed within US for $4.50-$13.50. We are sorry to say that most of these Megill Gauge Pins are no longer available from the manufacturer. What we have is in stock, new old stock or used. 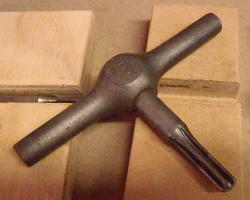 Inquire for availability of all Megill Gauge Pins. Our Cushion Quad Guides are always in stock. * "THE" Solution to pins crushed by engraving or polymer plate base... WILL NOT BE CRUSHED by base! DESCRIPTION DETAILS PRICE AVAIL ship wt. Rouse 45 pica stick slot hole, knee-action $45.00 ? 35 picas x 11 picas -7 .5"
Don't lay your stick on the level - keep it at a safe angle - without damaging anything beneath it - or letting loose type fall over. - brand new, stained & oiled - made to last a lifetime. Photo of Sticks Currently in Shop. We can't sell all of these, but we can sell some of them -at the prices shown below. These cases are used; some are like new, some very old ; some clean, some dirty. A $4 packing charge will be added to each order of 1-3 cases to cover time, tape and cartons. Rates Vary and often change. Please check for specific shipping costs before placing order. PLEASE CHECK FOR SPECIFIC SERVICES AND RATES TO YOUR LOCATION BEFORE PLACING ORDER. note: these are old, used cases. Some may be dirty and dusty. Please be prepared to clean and oil the cases yourself, or ask us to do it before shipping. 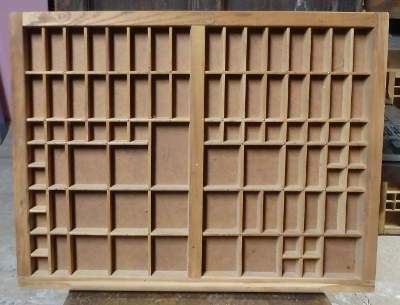 for use in old-style open 14-case "city stands"
Made by Thompson Cabinet Company for Kelsey Co.
Full Sized California Job Case 32 1/4x16 5/8"x1 3/4"
10x12" galleys 1-5, $6 each. 5-10; $4 each 10-20; $3 each. New fonts, old fonts, all sizes and styles and foundrys. ATF, Stephenson Blake, Monotype, some wood type. We'll post the list as soon as we can. Theo sold his equipment to Micah who in turn sold it to someone in Europe. 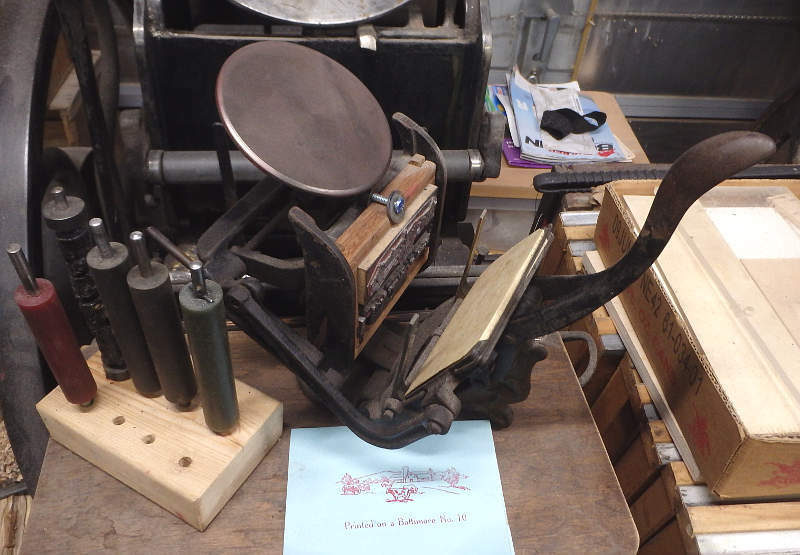 Most offerings assume a 3-4 hour "afternoon in the shop" combining any of the subjects or projects listed below with experienced, traditional letterpress printers Alan or Barry for $150. Visit our growing section on letterpress makeready and other techniques worth seeing or reviewing. * On-site training or service requires 1 hour in shop prep of travel kit for your particular situation. 4 hours with your press or ours - fix pretty much anything that's wrong with your press, level the platen, adjust ink roller height, mount tympan and solve just about any problem that's preventing your press from printing as it should. 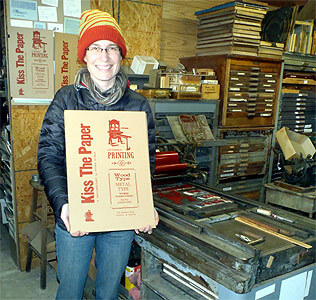 4 hours - Introduction to setting up and printing on the Kelsey Excelsior Press - your press or ours. Locking up the form. Setting make ready and gauge pins. Building a frisket. Ink up and print! Make frame-able prints from engravings on the Vandercook. Set some hand type. Proof it on the Vandercook. Mix some ink. 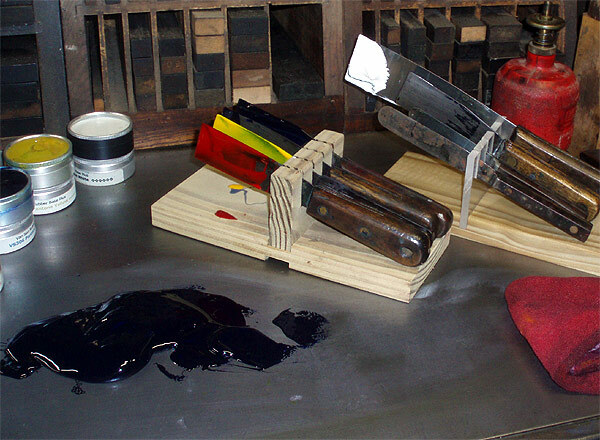 Print 50 or more cards or sheets on a hand-fed platen press - Pilot, Pearl, Chandler & Price, Golding "Official", Victor or Kelsey. Bring your paper, photo-polymer plates or metal engravings, and/or set some type and use our ornaments and presses to PRINT YOUR OWN CLIENT PROJECT. Scan Wizard) of Kelsey's famous printing course - more readable than the original! or the premier and perfectly machined Boxcar Press bases available. Used, operating or Rebuilt Presses at the Excelsior Press - serviced, cleaned & operating well. Come print before you buy! Private owners around the country with with presses or equipment for sale or in need of rescue. 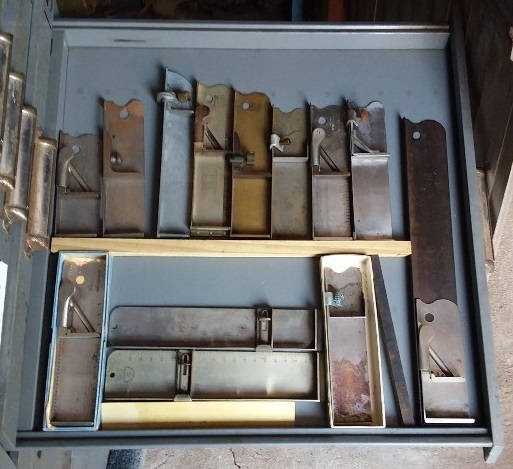 more recent listings in the "new system"
* KIT - C&P - includes 6 wedge quoins, (with key or shooting stick) reglet, gauge pins, starter font of wood furniture, tympan packing. 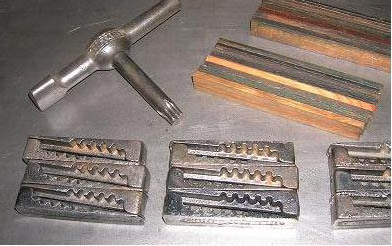 * KIT - Heidelberg - high speed quoins with wrench, reglet, furniture, packing as above. Excelsior Press USED presses, restored to good operating condition. We print with any of these presses before it is sold. Kelsey Excelsior size 3x5 $650 incl. Other presses are currently scheuduled for restoration.Check back or inquire please. 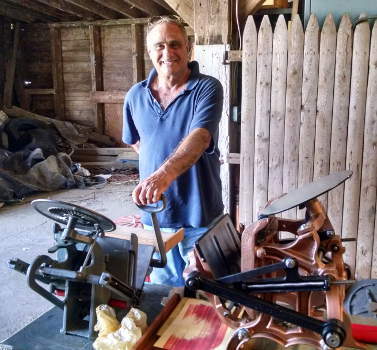 After nearly ten years restoring presses, Lou has retired from press restoration and no longer restores and sells presses. Totally disassembled and rebuilt to better than factory specs. to keep things simple, where we can use USPS Flat Rate or Regional Rate packaging, we just round up or down to charge $5, $10 or $15 shipping - plus insurance where appropriate. *We will be adding Regional Rate size and rate info to the chart below. 13-5/8 x 11-7/8 x 3-3/8"
** Overseas shipping is available, but it takes time, costs more and can get complicated... We're not very experienced (yet), but we'll do our best. First, an apology. This page began simply as a place to list some spare equipment we had for sale. But it has grown quite a bit since then and really should be replaced by a proper shopping cart. We are working on putting together a proper shopping cart to make things easier, but until then, please bear with us. We're doing the best we can with very limited resources. a list of the items you need. We will respond by email with a link to your packing list. Once you approve the order, and we have it ready to ship, we will upgrade the packing list to an invoice with a PayPal "Pay Now" button that will transfer our information for your order to Paypal where you can make payment using your own Paypal account or a major credit card. Once payment has been received via PayPal, we will use their easy-label service to print postage and will deliever your box to the post office first thing the next morning. You will receive tracking info via email. Please note in your order if you would rather pay another way and we will try to accomodate your request. We ship orders of 12 oz or less via USPS First Class Mail and generally use USPS Flat Rate boxes for all heavier items. We can make a carton or crate to accomodate anything we sell, but some orders will require special packing and shipping quotes. 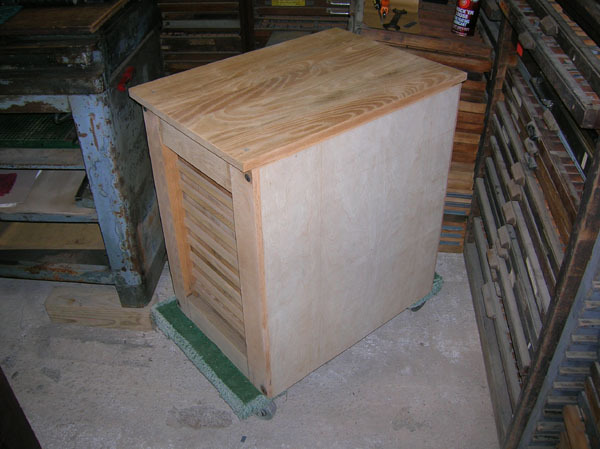 10/25/07: We are hoping to soon be able to offer Kelsey Press INK TABLES for sale. 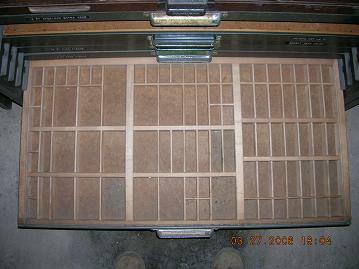 10/26/07: we are also preparing some "just like Kelsey" Excelsior Press "Complete Printing Outfits" which will include type, composing stick, leads & slugs, furniture & reglet, type cases, quoins & keys, tympan packs, gauge pins and the Kelsey Printer's Guide. Watch here for an announcement or add your name to our "I'm interested" waiting list. Peggy & Gayle's Dad's basement shop in Allentown - 3 big C&Ps & lots of type lost TO SCRAP MAN!! June, 2015 - 8 x 12 C & P Early Series, 30" Oswego Paper Cutter - available in Belmore Long Island.